A spacious well-presented and much improved three/four bedroom end of terrace family home with garage in a popular location enjoying excellent views over the town of Ilfracombe to Hillsborough and the Bristol Channel. Inside are a pleasant sitting room with a box bay window, a separate dining room, modern fitted kitchen, three bedrooms (two doubles and a single), and a modern bathroom. The attic could be turned into a study, a music room or used for storage. Outside is a low-maintenance rear garden while to the front are the small garden and paved area. At the rear is a small paved yard and patio area, and there is a further sunny rooftop patio/sitting area. 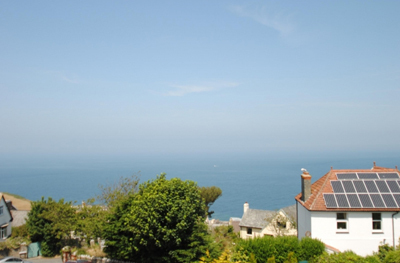 The property has been carefully maintained and improved over the years and the accommodation has a light and airy feel, has been decorated in neutral tones and enjoys excellent views over the town towards Hillsborough, the Bristol Channel and distant Welsh Coast. The guide price is £175,000. For further information please contact Webbers on 01271 863091 or visit www.webbers.co.uk.